The GA2006H Vexo Hand Arm Vibration Meter makes all the measurements required by the regulations for HAV risk assessments. Price includes? Prefer to buy? 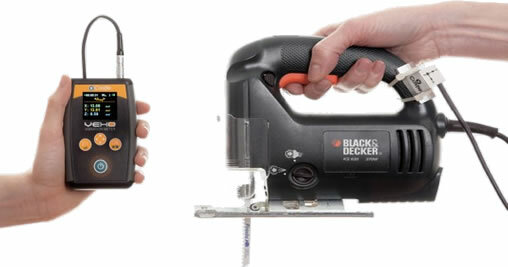 The VEXO range of hand-arm vibration meters have been designed to make measurements as easy as possible to carry out. There are enough complications when assessing HAV, without complicated meters settings making it worse. The GA2006H measures all the parameters needed to satisfy the regulations and the HSE guidelines. The GA2006H has been specifically designed for the measurement of hand-arm vibration. It is fully compliant with ISO 8041:2005, the standard that specifies the performance and tolerance limits for instruments used in assessing the human response to vibration. 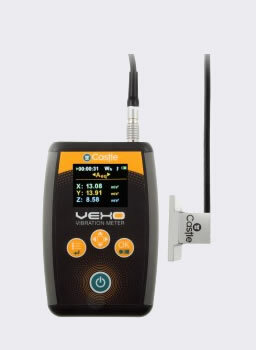 It is also the correct grade of meter for making measurements to ISO 5349:2001, the standard for the measurement and evaluation of human exposure to hand-transmitted vibration. 1. Attach accelerometer to tool. Mounting block and attachments are included in the kit. Press the OK/Run/Stop key to start the measurement. View the results on-screen or download to the software, which is included in the hire kit.